I made this birthday card for a friend at church who was born on New Years Day. I used this adorable image from Mo's Digital Pencil called Bella & Bronte Celebrating. The base of my card is pink cardstock backed in red cardstock and is continued through each layer. The sentiment and image is backed in red cardstock. I added red stickles to all the red cardstock. I colored the image using crayola and prisma colored pencils. I added crystal stickles to the dress and confetti and red stickles to Bronte's collar and Bella's shoes. I punched a strip of white cardstock using a heart lace border punch from Martha Stewart Crafts and added it behind the bottom of the image. I added a strip of white ribbon behind the image. 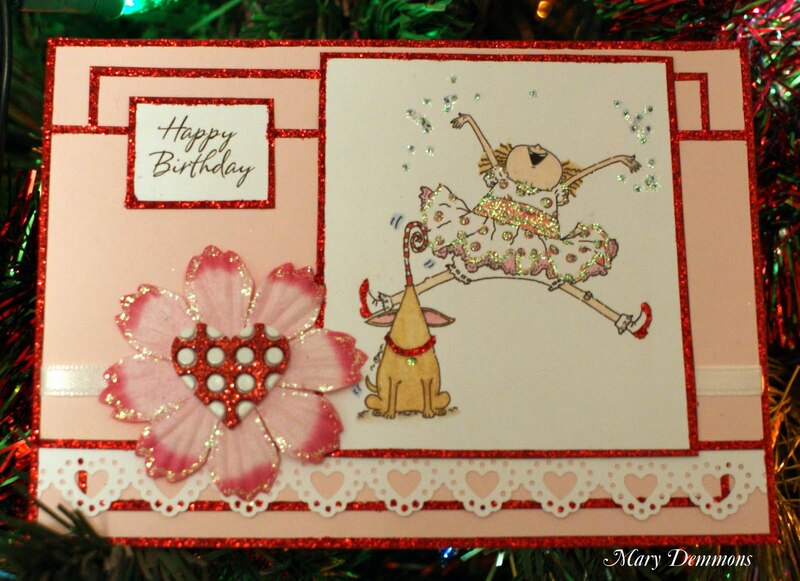 To finish my card I added a pink paper flower with a red and white heart button in the center. I added crystal stickles to the edges of the flower. Fabulous card Mary, love Mo's image - adorable, fantastic glittering and cute button. Great card! I like the layout and all the glitter and hearts. Glad you joined us in Mo's Challenge. Lovely card! I like the image you used. Thank you for joining The Pixie Cottage Challenge. Beautiful, she is so happy!!!! Thanks for joining The Pixie Cottage. Thanks for joining our Embelish It Challenge at Top Tip Tuesday.Your card is really sweet. Perfect image choice for a celebration! I love the way you laid out and layered this card! Thank you for Celebrating with Fresh Brewed Designs!